A Second Degree ceremonial was carried out for the benefit of one candidate in Lodge Ben Cleuch No 782 on Monday 23rd April 2012. Each part was taken by an honorary member of Lodge Ben Cleuch No 782. Brother James Campbell PM, Immediate Past Master, was in the Chair. 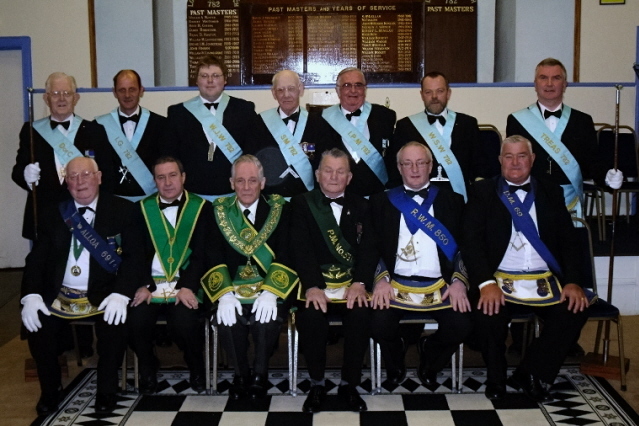 The photograph below shows the Office-bearers of Lodge Ben Cleuch No 782 with a front row of Honorary Members who were from left to right: Bros Hamilton McGlone PM (69), Robert Somerville PM. (69), Andrew McKinnon Right Worshipful Provincial Grand Master., Harold Dormer PM (531), Matthew McKay PM Right Worshipful Master (850) and William Robertson DM (69). I am afraid that Brother Dormer was concentrating on his forthcoming ritual when the picture was taken.